Sheer lingerie perfection - Lucretia offers a dark but cool summer option to your corsetry wardrobe. With built in suspenders, there is no need for the extra bulk and layer of a suspender belt. This underbust corset features bold finishing and strong lines with all metal components. Lucretia will hug, cinch and support you all day long while allowing the skin to gently breathe. Lucretia is hand-made from sheer black corsetry net and carefully finished with external boning channels in luscious black duchess. The 6 elasticated suspender straps have metal clips. Internal luxury features include velvet ribbon lining, waist tape and double satin lacing. A combination of spiral steel and flat steel corsetry boning creates a stunning vintage hourglass shape. Two piece gold busk and machine set eyelets as standard. All top quality, German components. Under your favourite dresses & skirts for a nipped in curve or for the perfect boudoir enticement. Looking for more curve? 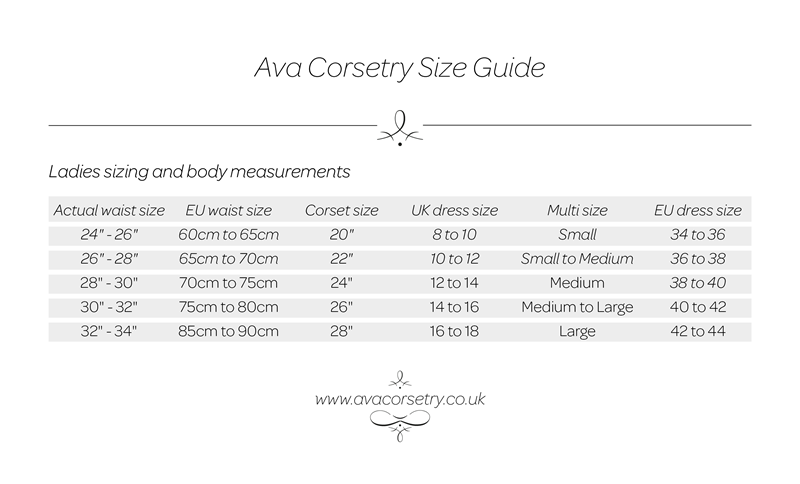 Ava Corsetry now offers a unique and affordable upgrade service to all corsets; simply contact us for details.